Product information "Human Tongue Trophy"
The humans are short lived and greedy creatures, and they speak too much on topics they know nothing about. That’s why you take the tongue from every human you ever come across. 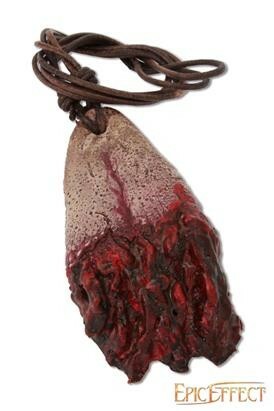 You keep a collection of these disgusting tongues, hung from leather around your neck. You want those lousy men to fear you and your ferocious might. Wearing your Human Tongue Trophy around your neck has caused quite a commotion in the human ranks. Related links to "Human Tongue Trophy"
Customer evaluation for "Human Tongue Trophy"